Random House Inc. was a key ACX launch partner when ACX opened in 2011. By embracing this entrepreneurial initiative, Random House helped to make even more titles available in the audio format. Random House is the largest trade book publisher in the United States and offers many of its titles as audiobooks published under the imprints of the Random House Audio Publishing Group. The ACX program supplemented Random House's ongoing audio publishing and licensing efforts. Random House offered titles across a wide variety of genres, including literary and commercial fiction, science-fiction and fantasy, current affairs, history and biography. ACX's innovative production financing options meant narrators, producers and audio book professionals had the opportunity to audition to produce these Random House titles for distribution as digital audiobooks. 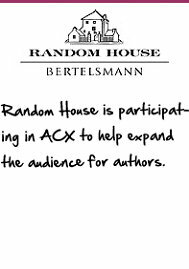 ACX invites other forward-thinking publishers to join Random House in expanding the audience for authors. I'm inspired by Random House – get me started on ACX now!